A pedestrian struck and killed by two vehicles January 8 on Mobile Highway has been identified. The Florida Highway Patrol said Thursday morning that Helen A. Feeney, 70, was killed in the accident at Mobile Highway and Tonawanda Drive, near Walmart. Feeney attempted to cross Mobile Highway and was struck by a 2009 Chevrolet pickup truck driven by Joel Williams of Cantonment and a 2003 Ford car driven by Leslie Hall of Pensacola. The pedestrian was pronounced deceased at the scene by Escambia County EMS. No charges were filed against either driver, according to the FHP. A Century woman was sentenced Wednesday for her role in the quarter million dollar robbery of the Bank of Brewton last February that was carried out with the help of a bank teller. Robin Ann Godwin, 43, was sentenced to 18 months in federal prison along with mental health and substance abuse treatment. 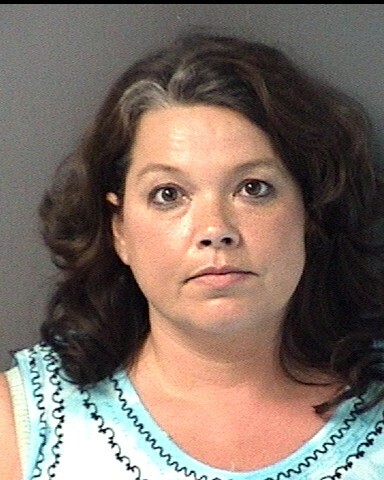 She was also ordered to pay $124,026 in restitution. She had entered into guilty plea to a bank robbery back in October. As part of that plea agreement, Godwin will not appeal her sentence. According to federal court documents, Godwin formulated a plan with bank teller Pamela Steele to rob the Bank of Brewton. In December, Steele pleaded guilty to conspiracy for her part in the robbery and was sentenced to one year and one day in prison. Once released, she will remain on probation for three years. Steele was also ordered to pay $124,026 in restitution. Both women had faced a maximum of 10 years in prison. 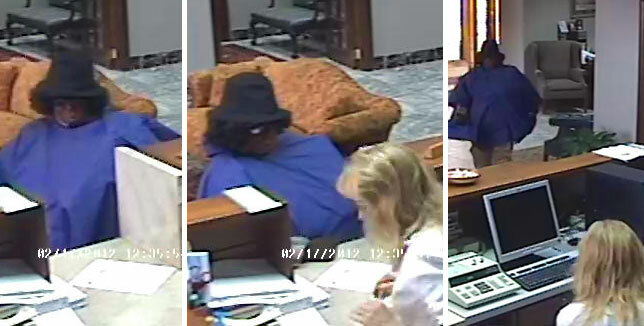 On February 17, 2012, Godwin entered the Bank of Brewton wearing a blue poncho, a grey fedora, large sunglasses, black face paint, a black Afro wig and body padding. Godwin asked Steele about renting a safe deposit box, and Steele took Godwin into the bank vault. Once inside the vault, Godwin pulled a large bag out from underneath her poncho and demanded that it be filled with cash. Steele then filled the bag with approximately $255,000 in cash, federal documents state. Steele did not put any bait bills or dye packs in the bag along with the cash. Godwin then fled the bank with the bag full of money. Godwin was taken into custody April 12 as the FBI raided a small travel trailer located in a campground at 1300 Liahona Trail in Bluff Springs. “We are executing a search warrant related to a recent bank robbery in Brewton,” James Stewart, a FBI supervisory senior resident agent, told NorthEscambia.com as agents worked to complete their operation. Nearly a dozen FBI agents from field offices in Mobile and Pensacola spent a couple of hours searching the travel trailer in Bluff Springs Thursday night. Multiple containers of evidence, reportedly including at least part of the $255,000 — were removed by agents and placed into the back of a SUV. Some of the federal agents were wearing shirts identifying them as members of a “FBI Evidence Response Team”. Working undercover, they would not allow their photographs to be taken by a NorthEscambia.com photographer. Campground residents were inside neighboring travel trailers as FBI agents finished executing the search warrant. 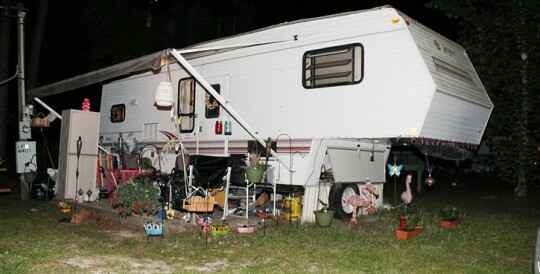 Even a couple of hours after federal agents arrived at the campground, some of the neighbors could be seen periodically peeking out of their doors and windows at the travel trailer in “Lot 2″, with it’s patio crowded with lawn chairs and outdoor decorations. Pink flamingo lawn ornaments and potted plants surrounded the patio — nothing making it look out of place for the quiet area just a few feet from the Escambia River. 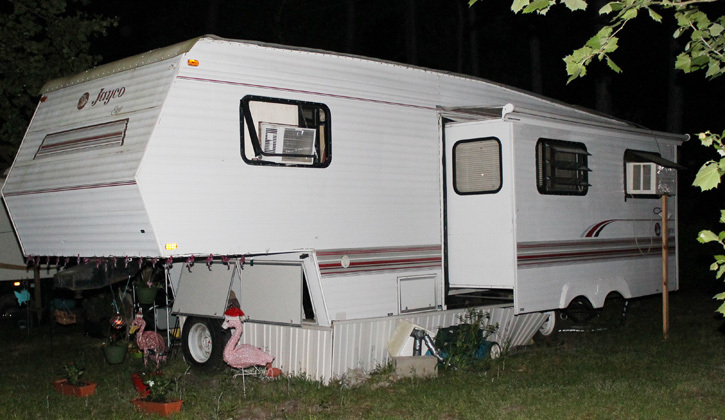 Pictured bottom inset and below: FBI agents executed a search warrant related to a Brewton bank robbery at this travel trailer on Bluff Springs Road south of Century in April 2012. FBI agents, who were just off camera, would not allow their photographs to be taken. NorthEscambia.com exclusive file photos, click to enlarge. Northview High School assistant coach Ty Wise has accepted the head coach and athletic director position at Graceville High School. 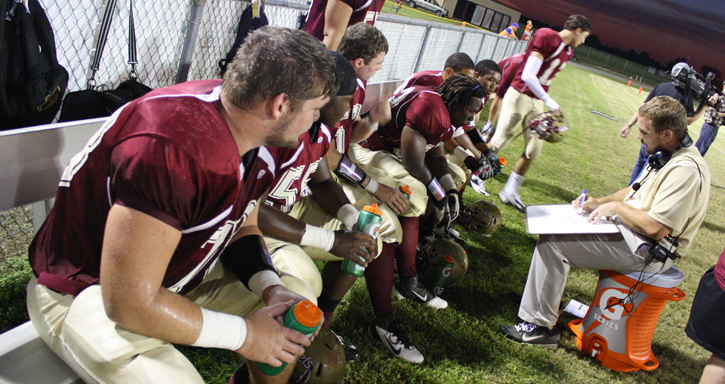 Wise has been on the Northview coaching staff for four years. As offensive coordinator, he led a Chiefs offense that accumulated over 1,000 points during the last two seasons and a Class 1A state championship win this past season. It’s a move that could have Wise and the Graceville Tigers on the opposite side of the stadium from the Chiefs this upcoming season — both teams are Class 1A Region 1…meaning they could feasibly face each other in the state playoff series. The move to Graceville, Wise said, was the most difficult decision he has ever had to make in his professional career. But, much like the Northview players chant in the huddle following every football game, Wise said he’ll always be a Chief. Wise, who played football for the University of Miami, is scheduled to meet with the Graceville Tigers players today and expects to make the official move to Graceville before Spring practices begin. At Graceville, Wise replaces March Beach who went 8-3 with a district title in 2012. Beach accepted the head coaching job at Marianna High School. 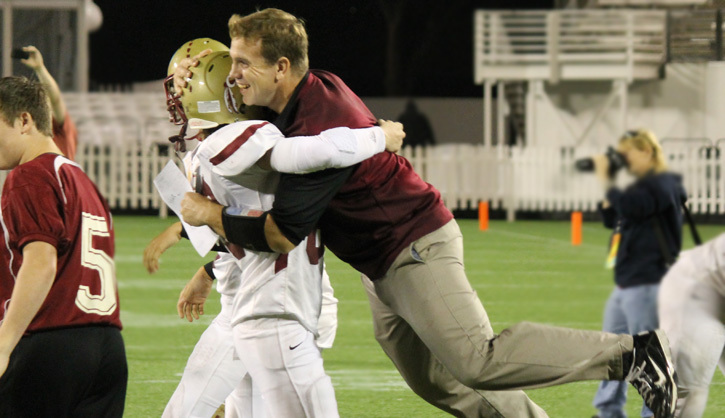 Pictured top: Northview assistant coach Ty Wise celebrates a state championship win for the Chiefs last December in Orlando’s Citrus Bowl. Pictured below: Wise plans out plays on the sidelines of a Chiefs game in Bratt. NorthEscambia.com photos, click to enlarge. Tonight: Mostly clear, with a low around 33. West wind around 5 mph. Friday: Sunny, with a high near 56. North wind 5 to 10 mph. Friday Night: Clear, with a low around 27. North wind around 5 mph. Saturday: Sunny, with a high near 63. Wind chill values between 25 and 35 early. East wind around 5 mph becoming southwest in the afternoon. Saturday Night: Mostly cloudy, with a low around 41. Southwest wind around 5 mph becoming west after midnight. Sunday: Mostly sunny, with a high near 64. Northwest wind 5 to 10 mph. Sunday Night: Mostly clear, with a low around 34. Northwest wind around 5 mph becoming northeast after midnight. Monday: Partly sunny, with a high near 63. Northeast wind around 5 mph becoming south in the afternoon. Monday Night: Mostly cloudy, with a low around 40. South wind around 5 mph becoming calm. Tuesday: A 20 percent chance of showers. Mostly cloudy, with a high near 69. Tuesday Night: A 20 percent chance of showers. Mostly cloudy, with a low around 47. Wednesday: A 20 percent chance of showers. Partly sunny, with a high near 68. Thursday: Mostly cloudy, with a high near 68. Ernest Ward Middle School will present the Jr. Miss EWMS pageant this Friday night at 7:00 in the school gym. Tickets are $5 for adults and $3 for elementary students. NorthEscambia.com will publish results and photographs Saturday morning. Nearly two years after the process began, a dilapidated asbestos-containing building in Century is gone. The building belonged to the Town of Century, which voted last October deed the property to the Century Chamber of Commerce, shifting the demolition responsibility to the chamber. The town council had voted to demolish the building at 7601 Mayo Street back in 2011, but asbestos concerns put those plans on hold. 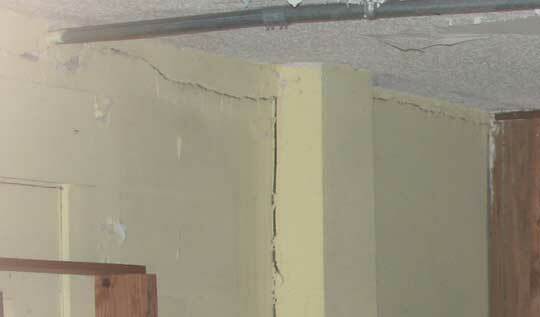 A study found asbestos in the older 6,400 square foot two story portion of the building, as well as in the newer single story portion of the structure, according to Century Mayor Freddie McCall. 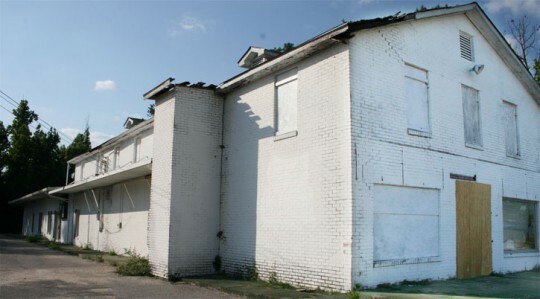 The town located an available grant from the Regional Planning Council to abate the asbestos and demolish the structure. Because the town was not eligible to receive the grant, the building was deeded to the chamber of commerce, which was eligible for the assistance. Now that the building is demolished, the chamber will have up to 10 years to lure development to the property or it will revert back to the town. The town will approve or deny any lease or purchase of the property. Until the property is sold to another party, it will be used for parking for the businesses and agencies in the Mayo and Church street area. The white, mostly brick building at 7601 Mayo Street (across from the old hospital) once housed doctors’ offices and even a pharmacy and soda fountain years ago. 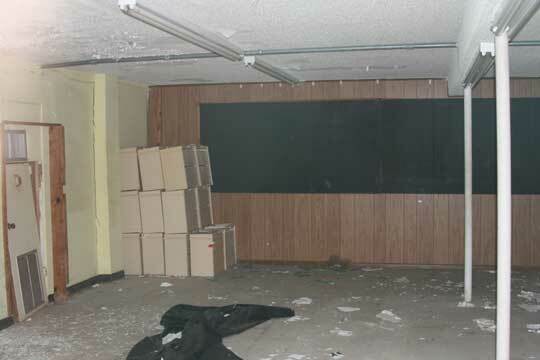 It has been abandoned for several years and was in an obvious state of disrepair with roof and structural problems. Pictured above: This building on Mayo Street was demolished. Pictured inset: The empty lot where the building once stood.Pictured below: The interior of the building prior to demolition. NorthEscambia.com file photos. Gov. Rick Scott will propose a $1.2 billion boost in education funding Thursday when he unveils his spending plan for the coming fiscal year, he told reporters during a Wednesday speech to newspaper editors. Scott said he would ask lawmakers to increase spending on public schools by around 6.5 percent, to about $6,800 per student. While that would mark an increase over the last two years, it would still be off the all-time high for per-student education funding. Scott had already floated a $2,500-a-year raise for all Florida teachers; that $480 million would be included in the $1.2 billion increase for K-12 education. If approved, it would mark the second consecutive year that Scott asked for — and the Legislature approved — an increase in education funding of about $1 billion. “In this budget, I am doubling down on our billion-dollar investment last year in education,” Scott said. The governor said that the recent recovery in the economy, and a projected rebound in state tax revenues, gave him more room to push for increased spending on schools. Republican leaders in the Legislature said they welcomed Scott’s proposal, but also questioned whether they would be able to fund all of it. The most recent forecast by state economists estimated the state would have a surplus of about $829 million in the coming fiscal year, which begins July 1. Lawmakers have been cautious about relying even on that funding, noting that automatic spending cuts by the federal government could harm the state’s economy if President Barack Obama and Congress don’t agree to alternatives. “Certainly, to get to that number, you would have to make some cuts somewhere else,” House Speaker Will Weatherford, R-Wesley Chapel, said in his own comments to the gathering. Scott said he would more clearly spell out how he would provide the money for the education increase in his full budget proposal, set to be unveiled Thursday. Democrats, meanwhile, credited Scott for the current increase but assailed him for cutting school funding in the first place. Senate Minority Leader Chris Smith, D-Fort Lauderdale, painted it as another step in a political reinvention aimed at Scott’s 2014 re-election campaign. “When he’s now throwing gimmicks and dollars at education after he came in and slashed education tremendously, [it] shows that he’s finally admitted that ‘I was wrong to try to starve education,’” Smith said. Today is the final day to pay real estate and personal property taxes and receive a two percent discount, according to Escambia County Tax Collector Janet Holley. made on the tax collector website by midnight January 31. Taxes can be paid online at www.escambiataxcollector.com. For more information, call (850) 438-6500, ext. 3252. 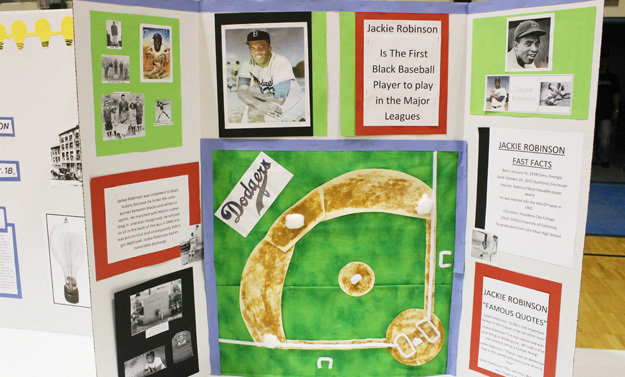 History came alive through the eyes of students at Ernest Ward Middle School recently as they displayed weeks of work on projects for National History Day. The History Fair in the school’s gym capped off a project in which EWMS students were required to do research into a topic. 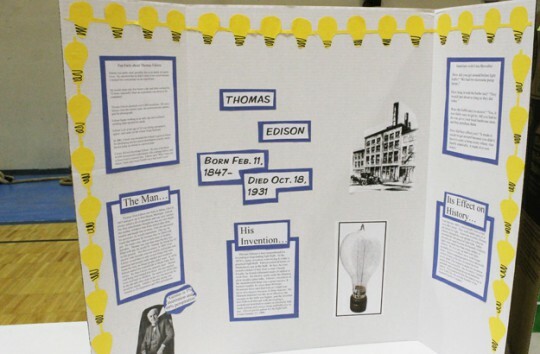 The research was presented in exhibit form, much like the typical science fair, or as a drama or web presentation. Students complete projects either individually or in teams. 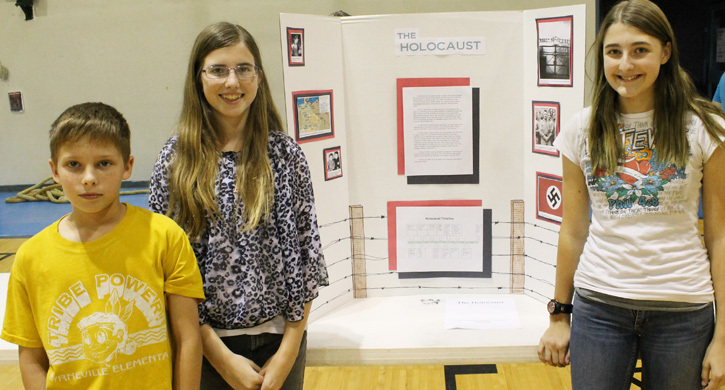 Pictured top: (L-R) Jacob Borelli, Alyssa Borelli and Victoria Amerson with their project on The Holocaust. 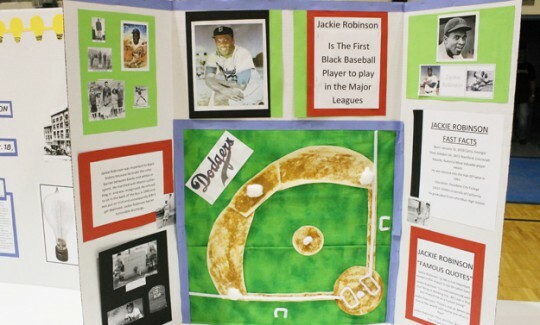 Pictured below: EWMS History Fair projects on Jackie Robinson and Thomas Edison. NorthEscambia.com photos, click to enlarge. Tonight: Mostly cloudy, then gradually becoming clear, with a low around 34. Breezy, with a northwest wind 10 to 20 mph, with gusts as high as 30 mph. Thursday: Sunny, with a high near 59. Northwest wind around 5 mph. Thursday Night: Mostly clear, with a low around 34. West wind around 5 mph. Friday: Sunny, with a high near 59. North wind 5 to 10 mph. Friday Night: Mostly clear, with a low around 35. Northeast wind around 5 mph becoming calm after midnight. Saturday: Partly sunny, with a high near 61. Calm wind becoming south around 5 mph in the afternoon. Saturday Night: A 20 percent chance of rain. Mostly cloudy, with a low around 42. South wind around 5 mph becoming west after midnight. Sunday: Mostly sunny, with a high near 65. North wind 5 to 10 mph. Sunday Night: Partly cloudy, with a low around 36. Monday Night: Mostly cloudy, with a low around 41. Tuesday: Mostly cloudy, with a high near 68.